Riunire il mondo in un unico pezzo di terra rappresenta un ritorno all'unitá del pianeta, all'unitá del genere umano, in barba alle divisioni che tanto comodo fanno ai nostri governanti! e cosi gli Stati Uniti si ritrovano davanti al muso tutti gli Arabi, mentre a sud confinano direttamente sia con Cuba che la Colombia! Noi europei invece ci troviamo l'Africa in casa finalmente. Basta alle migliaia di morti in mare per arrivare in Europa, adesso ci arrivano in bicicletta! Ancora, finalmente gli afroamericani si riuniscono ai loro cugini africani tout-court e li possono andare a visitare in autobus. Non solo, i marocchini portanno finalmente andare in Quebec a piedi! finalmente ora la mappa ha visto la luce. viva le geografie alternative! Ottimo!! Grazie per il tuo blog!! This is very good. Much love from the USA. There is something wrong in these map. Japan is a arc of volcanic island, not a block in Pangea. The scale of the countries is not right. China is not that big. Canada is bigger. The continent of Africa is smaller, especially the Northern part. Antarctica is bigger.Australia is bigger. Saudi Arabia is smaller. Mexico is smaller. Indonesia, Philippines, Borneo, and Japan should not be on this map, they are volcanic islands, over great lengths of time, they come and go, in different sizes and shapes, or dissapear entire. I can keep going, but, this would get tedious. yes, it's just a trial, it can be better. WOW thank you for the link to the overlap maps! It may not be a perfect map but if this map were reality I could take the train to any country I wanted. Rail lover Pete. It depends on the map projections. So the area is most of the time not projected correctly and in most maps Africa seems to be smaller than Russia or Canada, which is not correct, since Canada and Russia are close to polar regions where the surface area projection from a sphere onto a plane is multitplied and therefore they appear larger than they are. The first thing I thought when I saw this is that I wanted to buy a print for my wall. Will you think of making it available for purchase at some point? I am a Geography teacher and think this would make a beautiful print for my classroom. Can I also receive a print? Thank you! Beautiful piece! Damn it. Switzerland had sea access... We missed paying attention while the continents where moving. Do you have versions of your Pangea Politica map available for sale? I can point you at places that will handle that for you if you're interested. "The World Is A Dangerous Place To Live, Not Because Of The People Who Do Evil, But Because Of Those Who Do Not Do Anything About It." Bravisimo!!! Abito nella Argentina, ma Mia Mamma e nata a Roncade, Treviso! Tu sei di Roncade, e vero? Mia Mamma e nata nel 1939, e s'e venuta in Argentina nel 1952! Cognome Scopel. Anche qui nella Argentina ci sono dei Pietrobon!!! siii! di Roncade, Treviso! incredibile! Scopel è un tipico nome della zona. Argentina! nuestros hermanos al otro lado del charco! viva!! you live in Argentina Massimo?. and you put the antartic as chilean and brithih? Respect the real territory of the antartic. of course: you are right. this map has to be read as a conceptual work (or if you want, just a graphic game) the strength of the idea is to put together all the actual countries but of course the lands were different millions of year before. Himalaya, Pacific islands, Japan, and lot of places were even not existing as proper lands. it's just an idea (and it's also not perfect: I would change some parts like Iran, Mexico, Arctic and Tierra del Fuego... anyway. Beautiful, but... What is the Isthmus of Panama and Japan doing there? Anyway, good job. Super work! Try imagine former Earth in time of Pangea as globe with diameter of 2/3 of recent one. So your's Pangea + Pacific should cover it +- completely. It should be possible. :) Some event came 250 mil years ago, broken up and blowed up the former Earth and it was a reason of the biggest extinction ever too!
" the island first appearing over the ocean surface about 16 to 18 million years ago." This is the closest image to the reality of Pangea we can imagine, I presume. The dimension of several actual countries must have been changed with the movement of the huge tectonic plates - some were shrinked while others had enlarged or even popped up. The map fits only if the ocean waters kept the same level, which is unlikely. If the ocean water level changes 100 meters or so all the world geography will change dramatically. Anyway this is a superb work. Thanks for it and for the hundreds of funny, curious or unexpected ideas you share in this blog. 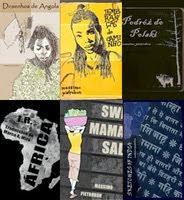 For me, this "Pangea" was was the prime key to discover your immense and eclectic creativity. I love this, I have read the critique and honestly, those people are soulless bores. Kudos. Hi Massimo! I'm organizing a conference on 'Decolonizing the Academy' at University of Edinburgh. Could we use your image (crediting you of course)? I've just discovered you're the creator. It's a fantastic graphic. Yes of course you can. I'm glad you liked it. We live to put all people together! I'm from germany and soon I have a presentation at school. I would like to use your image (of course you as an creator). Can I use it? I like ist, its fantastic! This is trending in UK in 2017 on Indy100 site! So I have a question. Why is 'Tibet' attached to India and Nepal? The Himalaya range and Tibetan Plateau to the north of Himalaya were created when the Indo-Australian Plate moved north into the Eurasian plate (which included the area that was pushed upwards creating the mountain range and Tibetan plateau). I think you are totally right. This map has some "errors" that I would also like to modify. This is one of them. Anyway this map is a conceptual and artistic map because it's impossible to insert all modern lands with their modern shapes and relative borders inside a world that was different with flooded regions, different mountains, rivers, seas, coasts. The general composition is correct but when you look at some specific detail you can always find "errors". 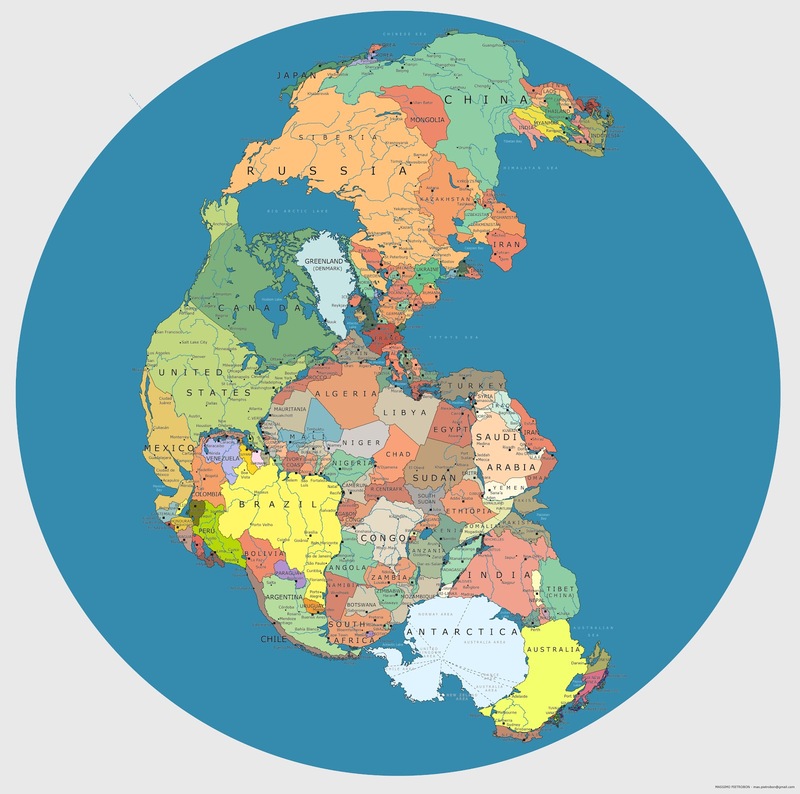 If you look for " new political Pangaea " in my blog you can see a more scientific version of this image. Hello! I'm a researcher for QI (@qikipedia on Twitter). We'd like to feature this map on our Twitter feed - would that be OK with you? We'd credit you, and link to either this blog or your Twitter (if you have one), of course. The only problem I see is that from Peru we have to walk over Honduras and Panama to get to the beach! Beautiful work! Can I use this map as an album cover? hello! yes, of course, can you quote my name and blog? it would be interesting to have a view (or the possibility to listen) your work. Bonjour et merci beaucoup pour m'ecrire sur votre projet. je trouve tres interessante votre idée et bien sûr je vous permits d'utiliser mon image pour votre livre, j'en serais vreiment heureux. merci aussi pour citer mon nom, comme auteur de la carte. c'est aussi vraiment interessant la proposition pour les autres cartes des autres continents. parlons-ne! Xin chào bạn. Nếu nhà bạn có phòng khách liền phòng ngủ, phòng khách liền bếp thì hãy tìm mua ngay 1 chiếc vách ngăn CNC gỗ đẹp tại vách nghệ thuật nhé http://vachnghethuat.com, bởi vì vách ngăn vừa tiết kiệm không gian, đủ tạo ra sự riêng tư cho văn phòng, lại có hoa văn trang trí đẹp! Thankyou so much that info is useful. Loved also your "through my eyes" collection...it is crazy! Is that the old picture of ancient World Globe ? All continent looks near each other .. If the answer is yes, it would be new sight in myself since I have never been seeing it before. Hence, it would be new knowledge for me. By the way, talking about knowledge, I have useful information about it, coming from certain website. It is about positive and negative impact of globalization in education. I hope this will bring benefit for all. I am delighted to see this article. As you see, you got so many comments for this. And all of them gave you well appreciation. That is good. Go ahead to give useful information further. By the way, you may like to see this also for adding new knowledge. It is about training information. Feel free to check it. Bien3D nhận thiết kế và thi công biển quảng cáo ngoài trời cho các cửa hàng nhỏ lẻ và công ty lớn ở khu vực Hà Nội. cho gia đình minh nhé! kệ tivi và nhiều sản phẩm trang trí nội thất khác. Bạn xem chi tiết tại website của chúng tôi nhé! Inphun.net nhận cho thuê phông bạt đám cưới và tổ chức sự kiện, tư vấn và thi công lắp đặt tổ chức sự kiện. bền mà lại có giá cả hợp lý. Bạn ghé thăm website golathanh.vn để tìm hiểu kỹ hơn nhé! kính cường lực, tấm bình phong, vách vệ sinh.